Although it’s not a book about cycling per se, if you’re interested in transportation issues in general, Tom Vanderbilt’s new book Traffic: Why We Drive the Way We Do (And What it Says About Us) is a great introduction to the topic. I just finished reading it yesterday, and it’s so good I think I might have to buy my own copy (though I rarely buy books except as gifts). It’s one of the few books both crammed with legit research but also fun to read. One time my Sara and I were so engrossed reading it on the El in Chicago that we missed our stop! I would write a much longer review, but one of my favorite economists Edward Glaeser has already written a superb one here: (LINK). I highly recommend it for anyone even tangentially interested in driving, traffic safety, or congestion. Paul Taylor, a leader in the effort to revamp Indiana’s bicycle laws, wrote a Viewpoint that was published in today’s South Bend Tribune. In a previous post to BikeMichiana.org, Paul provided a detailed summary of the bill, complete with a government link to the actual bill and instructions for how to email your legislator. Please feel free to post comments with questions and concerns. Massachusetts has passed a new bike law, with a significant effort from MassBike. As we continue with the effort to clean up and modernize Indiana’s antique codes, it can be helpful and inspiring to see what other states are getting done. It took them eight years and four legislative sessions even in a left-leaning state, but they stuck with it! 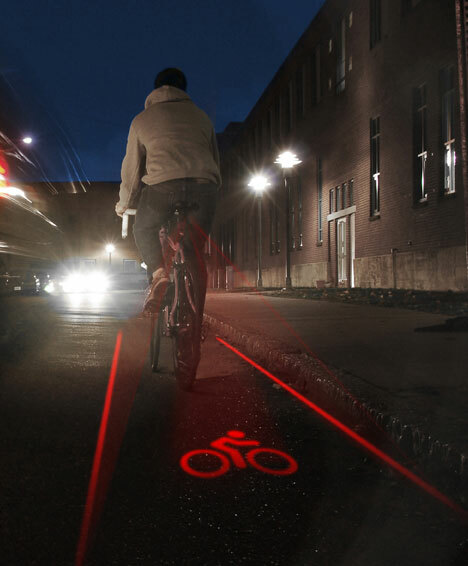 The internet seems to be abuzz about a new bike lane concept called Light Lane, a trailing laser-projected image of a bicycle lane. From what I can tell, these are still in development, and I’m not aware of any imminent plans to bring them to market. In fact, so few details are available that I wonder if this is purely in the conceptual stage, and the image at right is a Photoshop markup rather than a working model. In any event this is an interesting idea, and I look forward to seeing what comes of it. Thanks to Kyoko, Will and Jerry for bringing these to my attention! 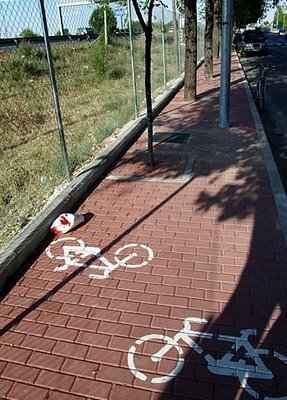 A friend recently sent me some snapshots of poorly executed bike lanes (these are alleged to be from Spain, but I haven’t verified the origin). I’ve seen some poor designs before, but these take the cake. It appears that these lanes were actually installed around the obstacles — making it virtually impossible for them to be used. Part of me wonders if this is a hoax, but then again I could imagine a well-intentioned non-cyclist implementing these without realizing just how unusable they are. Perhaps the majority of this bike path is perfectly clear. In any event, I think this image nicely conveys the importance of continuity and convenience in the design and implementation of effective bike routes. Personally, with lanes like this, I’d stay on the road. Yehuda Moon and the Kickstand Cyclery is a web comic about everyday cycling, with a bit of a Portland flavor. About every fourth or fifth strip so truthfully encapsulates some bit of bike life that I almost get deja vu! Funny stuff! Senator John Broden of South Bend has introduced Senate Bill 553, which affects bicycles and traffic safety. It has been read and referred to the Committee on Homeland Security, Transportation & Veterans Affairs. This bill is a product of the Safety Legislation team formed by Bike Michiana Coalition, and the Indiana Bicycle Coalition. This is a comprehensive bill that covers a lot of territory. The Bike Michiana Coalition held a bike summit on Saturday the 17th, and it was attended by representatives from an impressive array of local cycling groups, including: Bicycle Friendly Community Team, Bike Station Planning Team, Bike to Work Week, Chain Reaction Bicycle Project, Courteous Mass, Friends of Granger Paths, Friends of Pumpkinvine, Ghost Bikes, Indiana Bicycle Coalition, Indiana Bicycle Legislative Team, MBA, NIMBA, Notre Dame Cycling Team, and Paint the Town with Bicycle Lanes. Notably, the summit was facilitated by Jeffery Miller, the president and CEO of Thunderhead Alliance for Biking and Walking and Steve Buchtel, the southland coordinator for the Active Transportation Alliance. The meeting was generously hosted by Tim Maher and Mike Palmer of Barnes & Thornburg. Minutes from the summit [pdf] were taken by Karen Taylor. This lonely bike is near the Hope Rescue Mission near Downtown South Bend. Facebook.com now has more than 150 million members who are disproportionately young, wealthy, well educated, and well connected. It has become an indispensable mode of communication for a large segment of the population, and social online network sites may soon become as ubiquitous as cell phones. I’ve taken the liberty of starting a Group for BikeMichiana.org on Facebook, so if you have an account feel free to join. It may be mostly redundant to the existing site, but on the other hand it may add one more dimension of depth to the burgeoning cycling community we’re building. While you’re logged in, you may also want to become a Fan of the Indiana Bicycle Coalition and the League of American Bicyclists. Earl Blumenauer and James Oberstar have Pages as well (as distinct from Groups, which are less official). There is also a new social network site at CyclistVillage.com, but its membership isn’t nearly as large as Facebook’s 150 million.